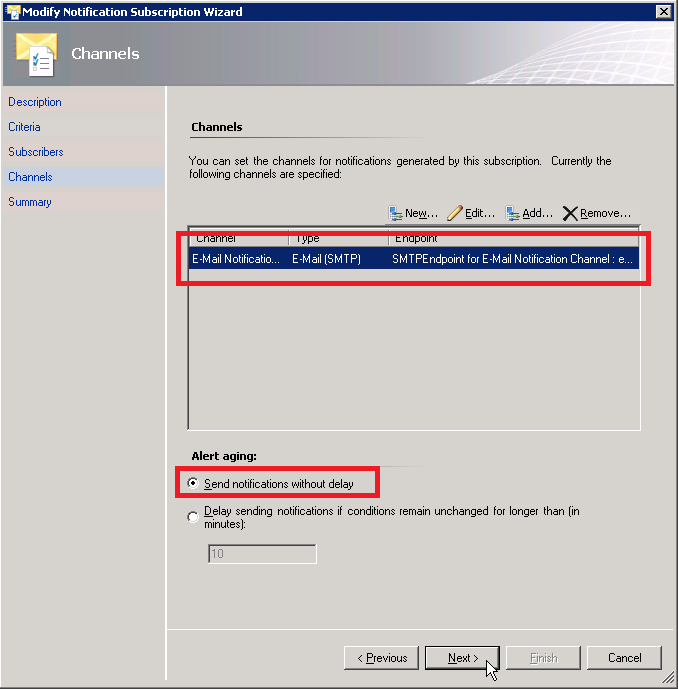 Events generated by System Center Operations Manager (SCOM), like alerts and warnings, usually indicate (upcoming) problems. Notifiying you’re system administrators enables you to troubleshoot te problem as quickly as possible. For a customer I’ve configured multiple distributed applications. Each distributed application defines a critical application that needs to be monitored. All distributed applications are displayed on a monitor showing the state of the distributed application. When an event is triggered, for instance because the service is down, a notification needs to be sent. Not only to the system adminstrators, who administer the infrastructure, but also to the technical and functional application operator. 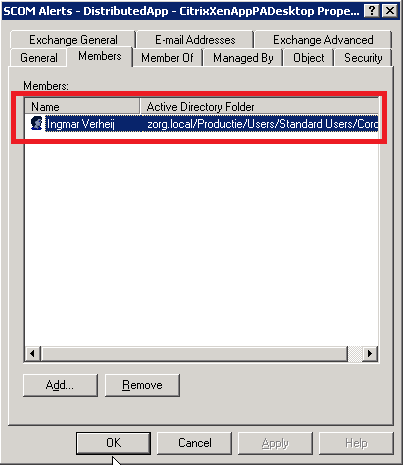 Active Directory groups are used to make the membership of the managable, since role based access control (RBAC) is used. 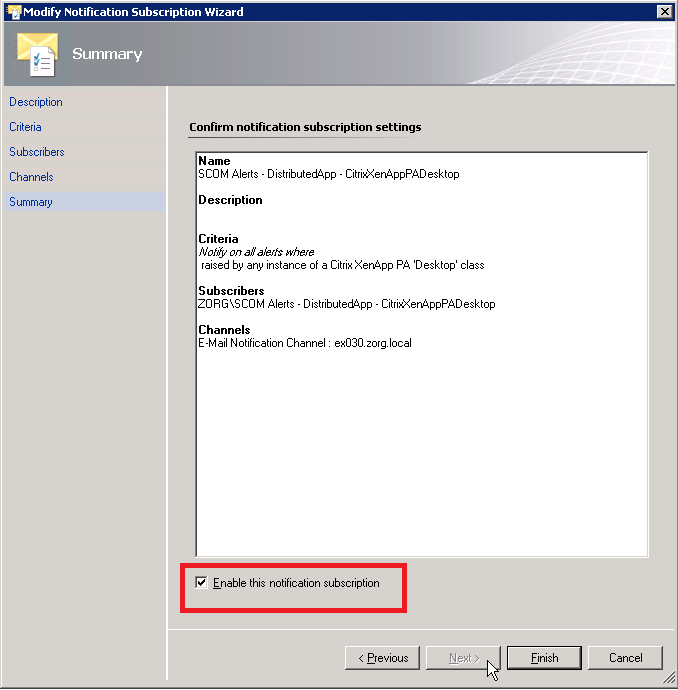 The first step in the process is creating Active Directory groups. 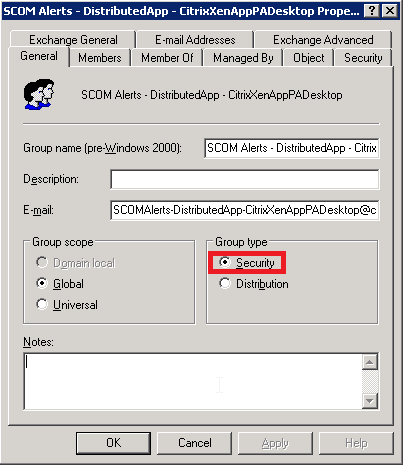 For each distributed application an Active Directory group is created, in my example “SCOM Alerts – DistributedApp – CitrixXenAppPADesktop’ is used . The group type is Security, not Distribution. This is required in a later phase. 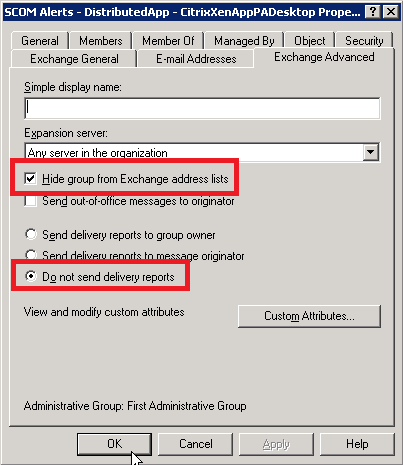 Since we don’t want the group to be displayed in the global address list, the group is hidden from the address list. We don’t want any delivery reports, so these are disabled aswell. Finally members are added, this are the functional and technical application operators who manage the application. 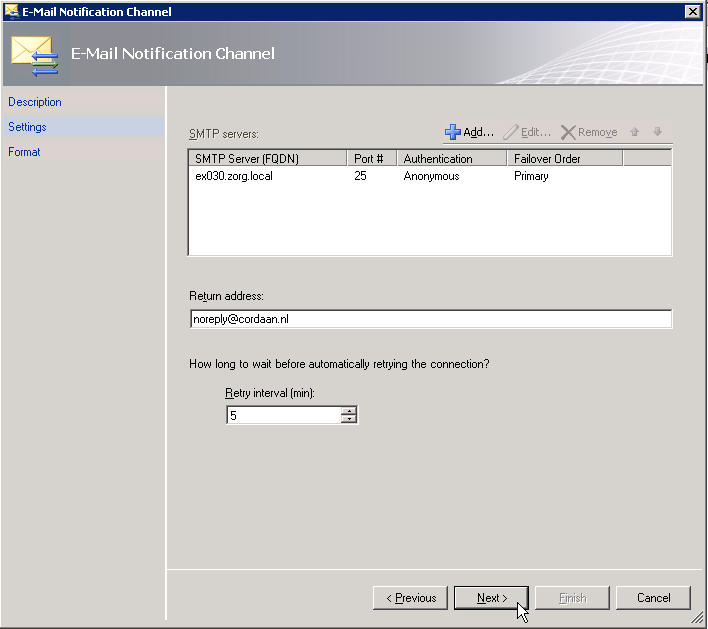 Next step is configuring a notification channel, this enables us to send e-mail from SCOM. 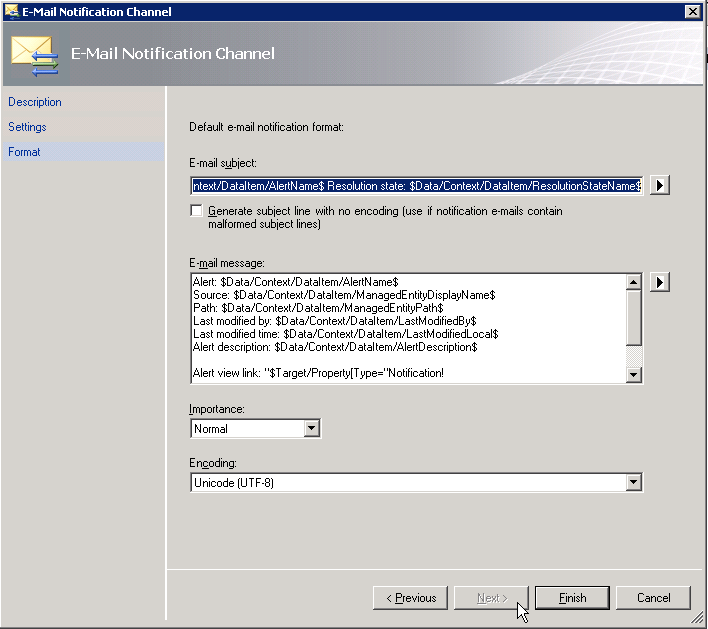 In the System Center Operations Manager open the tab ‘Administration’, select the node Notification\Channels and add a new E-Mail Notification Channel. 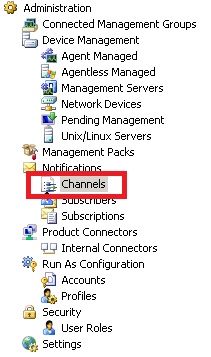 Give the channel a describing name, like the name of the channel and the mailsystem used. 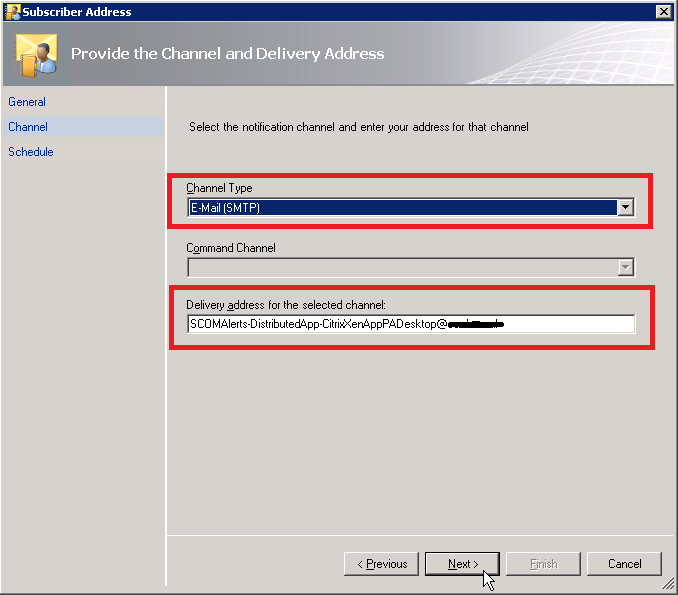 Then define the SMTP servers used to send the e-mails, specify the return address (you’ll want to monitor delivery errors, if an operator isn’t notified they won’t solve the problem) and the retry interval. Finally you can customize the format of the message that is send. The default message is quite technical. Then add a subscriber for each distributed application. 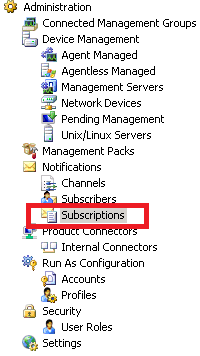 Select the node Notifications\Subscribers and add a new Notification Subscriber. 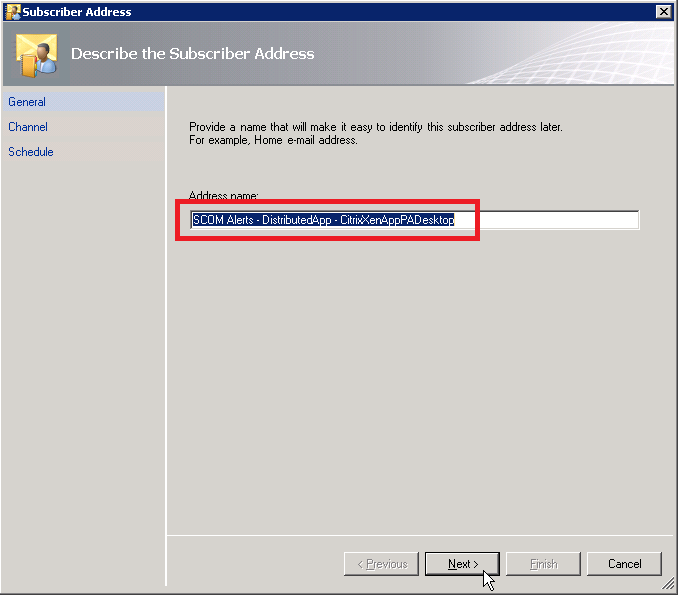 Define the name of the subscriber, this is the name of the group you specified in the first step (this is why the group type should be security). 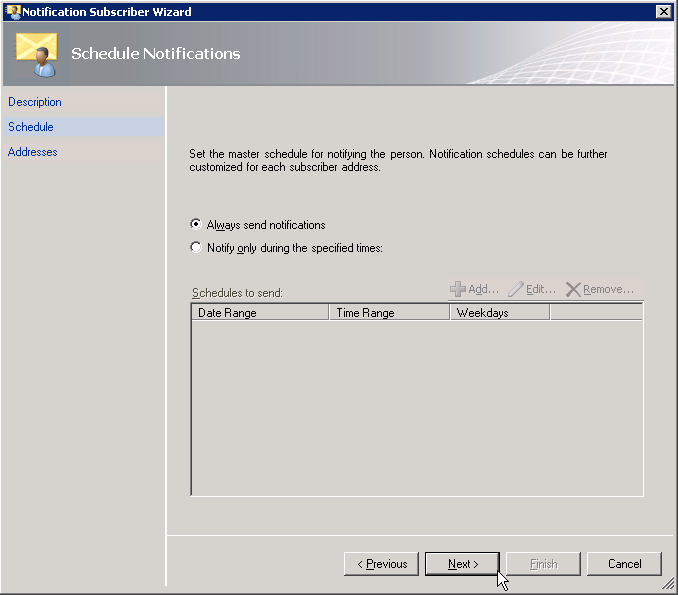 Then configure when the group should receive notifications, this applies to this subscription, you can change the schedule per e-mail addresslater. Finally add the address where the notification is send to. This will open a seperate wizard. Give the address a describing name, best practice is to keep the same name as the Active Director group. 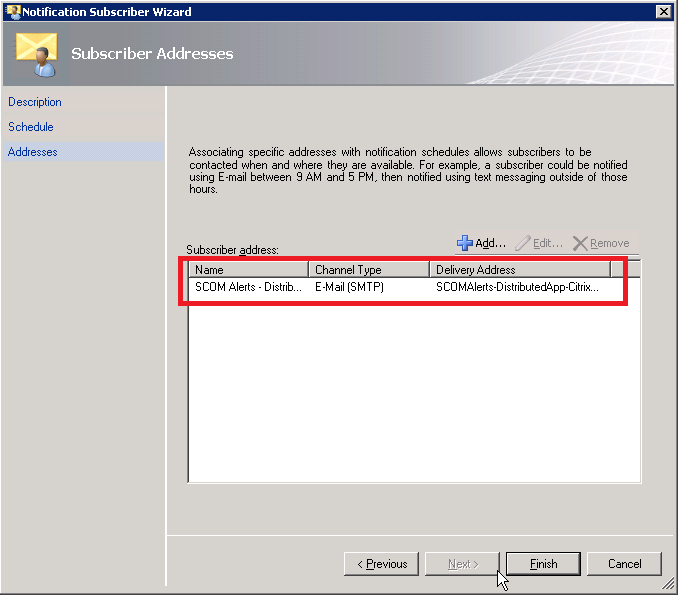 Specify the channel type E-Mail (SMTP) and specify the delivery address (the e-mail address). Finally you can specify when this e-mail address should receive notifications. The last step is to create a subscription. 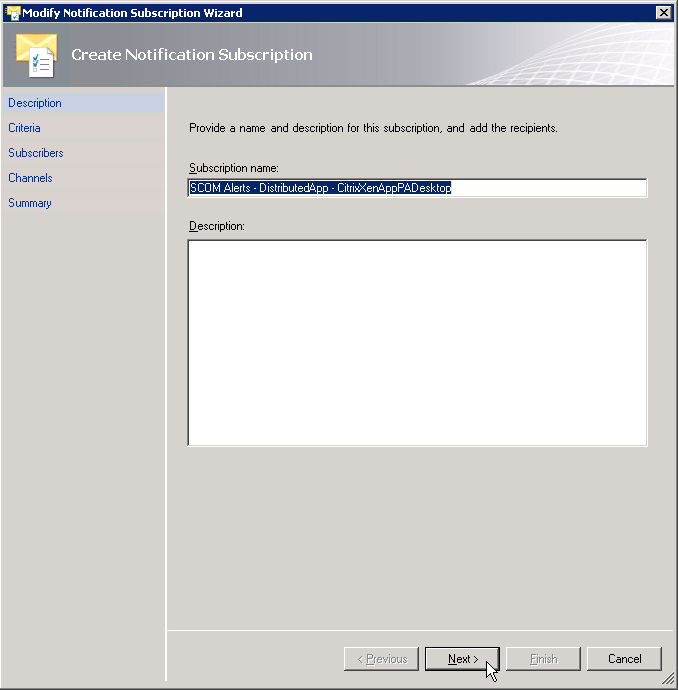 Select the node Notifications\Subscriptions and add a new Notification Subscription. 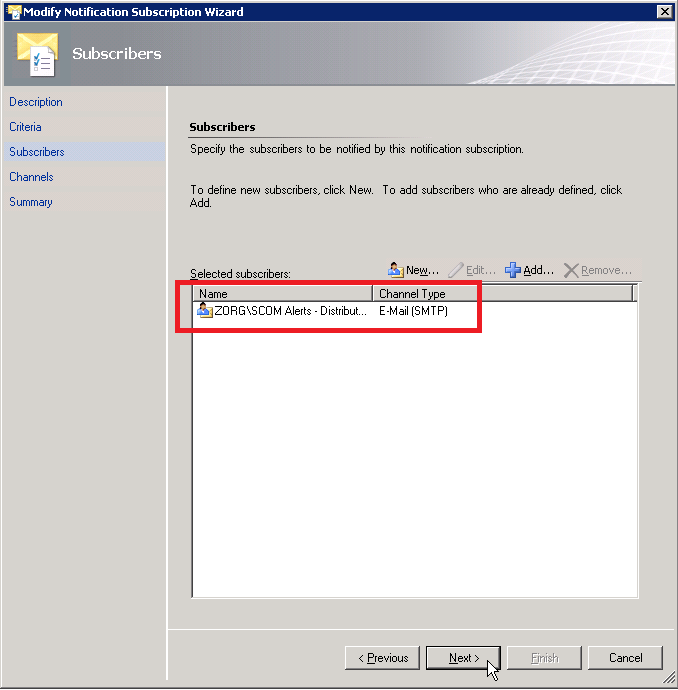 Start by specifying a describing name of the subscribtion, this is where you specify which notifications are sent to what subscriber (one or more e-mail address). 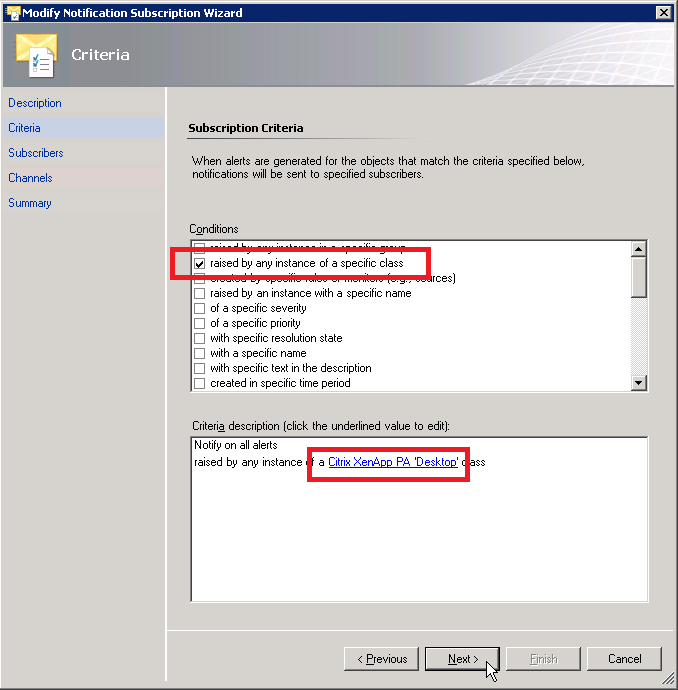 Then check the condition ‘raised by any instance of a specific class’ and specify the class, which is the distributed application you want to receive notifications from. In my example this is ‘Citrix XenApp PA Desktop’. 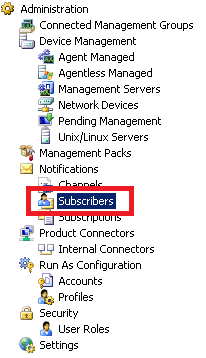 Then add a subscriber, this is the subscriber you created in the previous step, which should receive the notification. Next step is to add the channel you created earlier. 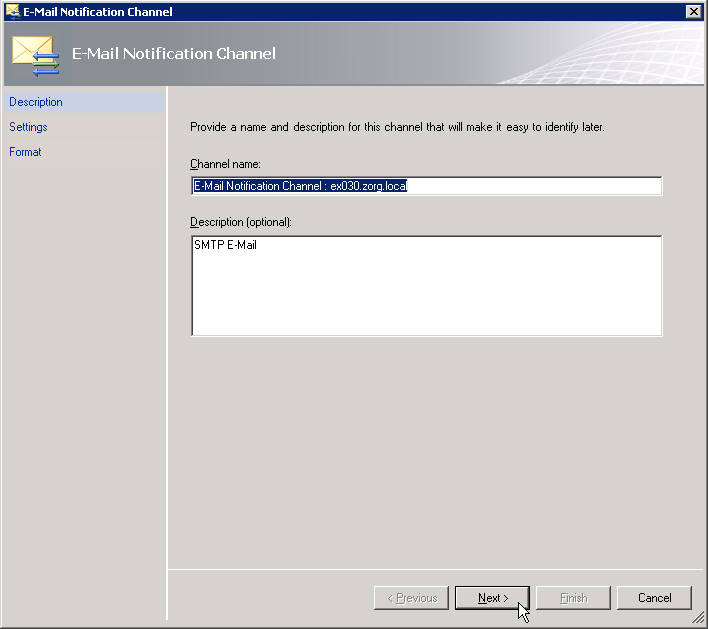 The notification will be send using this channel, which is E-Mail (SMTP). If events are triggered to frequent, and resolve fast, you can delay the notification. If the condition remain unchanged for the specified interval, the notification will be send. 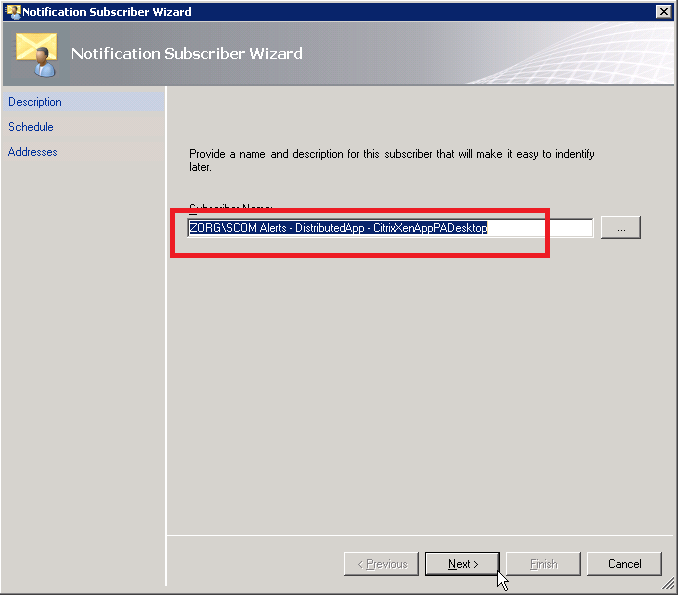 In the last step the summary is displayed, don’t forget to enable the notification subscription!